Well, after a longer delay than expected due to all sorts of unforseen reasons John and I managed to complete our refight of Brandywine today. 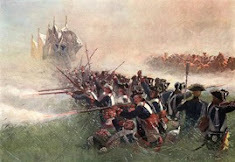 When we had stopped a few weeks ago, the British and Hessian reinforcements had just entered the table and were moving up to support the battered Grenadier, Guards and Lights, while George Washington had just turned up on the Rebel side, heralding the arrival of some much needed reinforcements. On the right the Hessian grenadiers were very slow in taking over from the shaken and disordered British grenadiers thanks to some useless command dice, but eventually they did manage to get into close range of the rebel line, saving the British grenadiers from more damage and possibly from routing! In the centre the Guards brigade stubbornly held on against significant rebel musket and artillery fire, but eventually the artillery and one unit of infantry facing them broke. Trouble was that the Guards were unable to advance due to being disordered and/or shaken and the gap in the rebel line was swiftly filled. I almost lost one battalion but thankfully managed to pass the morale test. On the left it was much more exciting. 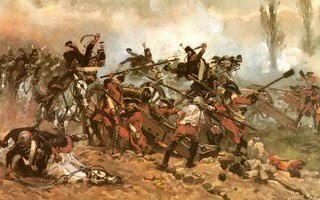 The British reinforcements advanced and were threatening the rebels in the town as well as the brigades facing the Light infantry. One rebel unit blundered and ended up charging a light batallion and was not surprisingly broken by the combination of closing fire and melee (no bayonets not good idea). This meant that its parent brigade had to withdraw as it was down to 50%, making a nice gap in the line! Sadly, my other Light batallion also blundered and launched a bayonet charge against a rebel unit to their front. The dice throws on my part were pants and Lights lost the melee, failed their morale and had to withdraw. This left a big gap in my line that thankfully the reinforcements could fill. John was feeding his reinforcements (2 brigades of militia) into the line on my left as well as into the centre holding the town of Birmingham. 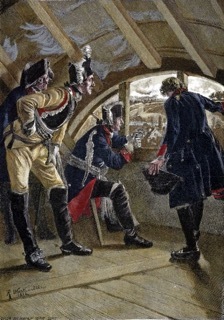 Many of his units along the entire line were shaken and he was not really in a position to do much more than hold out for as long as he could in the hope that the British might fail a few morale tests. It was not to be. One of my new British units charged the shaken rebels holding the extreme of the line in the town. Further along the line, a rebel unit had speedily plugged the gap in the front left by the destruction of a battery of guns and the forced withdrawal of a unit of infantry, led by George Washington using the 'follow me' rule. Sadly for them, and also for GW, for once I threw some decent dice and caused grievous casualties in the unit as it was fired on by two guns and a full batallion of guards, causing four hits which meant it became shaken with excess casualties. This meant that Washington was at risk. I threw a 6 and down he went. It was at this point that John conceded defeat. 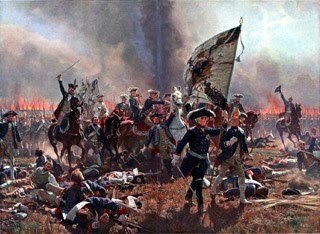 His left wing was being pressed hard by the Hessians, his right was crumbling and had nowhere to go, and his centre was almost all shaken. What reinforcements he had were being used to plug gaps. With Washington out of action what else could he do? The British had suffered serious casualties among their elite troops but were still there.....just. Thanks to the arrival of the reinforcements they were able to overwhelm the rebels on both flanks and pin them in the centre. 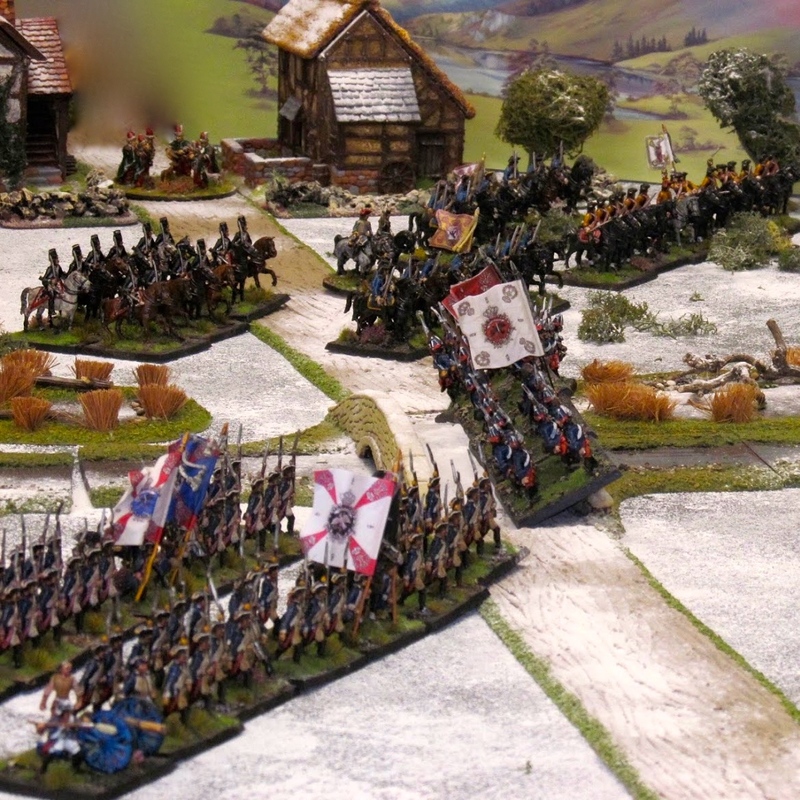 So, a British victory - probably not a surprise but it could have gone either way in the early stages and if I'd not made the Guards, Grenadiers and Lights a little tougher they would certainly all have run away early in the game. However, I do wonder whether I have the characteristics right for the British, and to some extent the rebels. The six units on the table at the start were the elite of the British army but to give them any chance of following the historical run of events I had made them large, elite, crack and steady. Without the crack and steady characteristics the whole lot would have broken very early in the game. OK, you say. 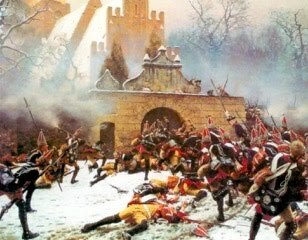 Fortunes of war, but the Guards and Grenadiers still made heavy going of their part in the attack, and the former spent much of the game immobile due to John throwing enough 6's to keep them disordered. The British line batallions were just as per the rulebook with no fiddling from me, but they didn't really face any pressure so wern't put to the test before the rebels conceded defeat. Making the elites 'large' was an attempt to reflect impact rather than just size (its not the size that matters missus, but what you do with it....) and maybe that was too much? The flip side is that maybe I should have made the rebels 'small' instead? We shall be doing the other half of Brandywine soon so I might try that out and see what happens. Next time will certainly not be as straightforward for the British.